I’m sure you have all heard this before, but I’m going to say it again. Strength training is so important! Working in the health industry I can’t tell you how many people I come across who are trying to lose weight and trying to be more fit but they refuse to pick up the weights. I see this with women especially. They are too worried about bulking up and looking too manly. I promise, if you are a woman and you start lifting weights you will not end up looking like Arnold Schwarzenegger. First of all, our bodies have too much estrogen and not enough testosterone for that so, unless you are taking hormones that won’t happen. Secondly, you need to be doing some seriously crazy training to bulk up like that. So pick up the weights! Strength training has some really great benefits for men and women; it’s not just for bodybuilding. Women in particular generally have less lean body mass than men, as we age we tend to lose even more of the lean body mass. Weight training is a great way to be proactive and help maintain that muscle mass to combat frailty as we age. 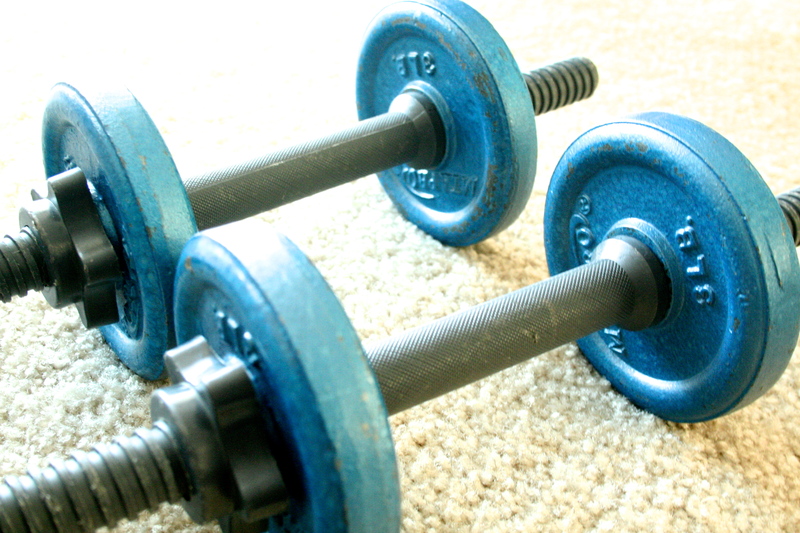 Weight training also reduces bone loss and can help prevent osteoporosis (“Strength training for,” 2011). Not only will it help you in the long run as you age but it will just make you stronger and more confident, and will make everyday activities a little easier. Contrary to what many people believe, weight training is also a great tool for weight loss for men and women. I remember when I was growing up, hearing that if you wanted to slim down you just had to do cardio at a low intensity for a long time (now we know that isn’t the best method but that’s for another post) and NEVER EVER lift weights if you want to lose weight. Well, that’s wrong. Studies have shown that regular resistance training can increase your resting energy expenditure 7% or more. That means if you have a resting metabolic rate of 1500 calories per day, that’s an extra 100 calories every day! It is thought that the increase in energy expenditure from resistance training is largely due to the energy requirements necessary to repair the muscle tissues after a strength training session. Assuming you do weight training 2-3 days per week it is likely that the increased metabolic rate will remain elevated as long as the resistance training continues (“Resting energy expenditure ,” 2010). Therefore, in combination with cardiovascular training, regular weight training c.n help you lose body fat, increase strength and be more toned and fit and not leave you looking huge and bulky, unless you want to be huge and bulky then in that case well, your workout will be a little different. For strength training American College of Sport Medicine (ACSM) recommends 1-3 sets of 8-12 repetitions with a load that is 60-70% of your 1 rep max (RM), the max amount you can lift for a single repetition ( if you are trying to find your one rep max, please make sure you are being safe and have a spotter). For endurance training ACSM recommends 2-4 sets of 10-25 repetitions with a load lower than 70% your 1RM (“Strength training for,” 2011). So, if burning more calories as rest, looking toned and fit, and being stronger and more confident doesn’t convince you that lifting weights is awesome. Well, then I say just give it a try for a few weeks. It doesn’t have to be an hour long session. If you aren’t comfotable lifting weights at the gym or are too intimidated by the big lifters, see if your gym has a resistance based group class, the instructors there will be able to teach you proper form and help you modify moves if necessary. Don’t have a gym? Try a resistance based, home workout video. Even just doing push-ups and squats while you are watching tv is a great place to start. Food labels can be difficult to understand and are at times misleading so it is important to be able decipher the nutrition facts and label claims to make sure you are getting the best nutrition from your food. Zero trans fats: Trans-fats are fats that are made by adding hydrogen to vegetable oil, a process used to keep the food from spoiling. The reason why is not exactly understood, but studies show that adding hydrogen to the oil increases cholesterol levels more than other fats when consumed. It actually raises your “bad” cholesterol (LDL) and lowers your “good” cholesterol (HDL) which increases your risk for heart disease. On the nutrition facts label, companies are allowed to claim that a product has 0g trans-fat if it less than 0.5g trans-fat per serving. So to know if a product really contains trans-fats you need to look at the ingredients list. If you see the words “partially hydrogenated” listed, the product contains trans-fats. “Fully” or “completely” hydrogenated oils are okay, unlike partially hydrogenated oils, the process to make these does not result in trans-fats. Reduced or low fat: Reduced or low fat products can be very deceiving and are not always the better option. If a product claims to be reduced in fat that means that there is 25% less fat than the original product. If it is low fat that means there are less than 3g of fat per serving. The problem with low fat and reduced fat products is that there is often an increase in sodium and sugar to make up for missing fat. So make sure to read the rest of the nutrition facts and ingredients to see what the better option is. One product that it might be better to buy the full fat version of is peanut butter. The average American consumes about 3 to 4 times the recommended amount added sugar per day! Over the course of the year that comes out to be about 84 lbs. of sugar per person. THAT’S A LOT OF SUGAR! But since we’re not just sitting around eating spoonfuls of sugar, where is it all coming from? You may be surprised to learn that sugar can be very sneaky and finds many ways to be added to the foods and beverages that we consume daily. Appropriately, natural sugars are sugars that are found naturally in foods like fresh fruits, veggies and dairy products. While added sugars include any sugars or caloric sweeteners that are added to foods or beverages during processing or preparation (such as putting sugar in your coffee or adding sugar to your cereal). Added sugars can include natural sugars such as white sugar, brown sugar and honey as well as other caloric sweeteners that are chemically manufactured (such as high fructose corn syrup). For natural sugars there are no specific guidelines or recommendations for amount to consume each day, but USDA does make recommendations for the amounts of fruits, vegetables, and dairy that we should consume each day. If you follow those guidelines you will not have to worry about consuming too much natural sugar. Poor nutrition- filling up on nutrient lacking sweets can cause you to miss out on important vitamins and minerals. Weight gain- Sugar sweetened foods are often calorie dense from sugars and fats, making them very appealing and easy to eat more of. Increase triglycerides- Triglycerides are a type of fat in the bloodstream and fat tissue. Eating an excessive amount of added sugar can increase triglyceride levels, which may increase your risk of heart disease.